A big change is coming to DigitalNC.org in the next few weeks. We want to give you a sneak peek! Why did we make this change? The company behind our current software had decided to withdraw support for sites like ours. In addition, we wanted to move to software that would be better at searching and browsing, and that could successfully share information out to search engines and other systems. We’ve been so pleased to collaborate with TIND staff, and we are excited about the possibilities opened up by this move. 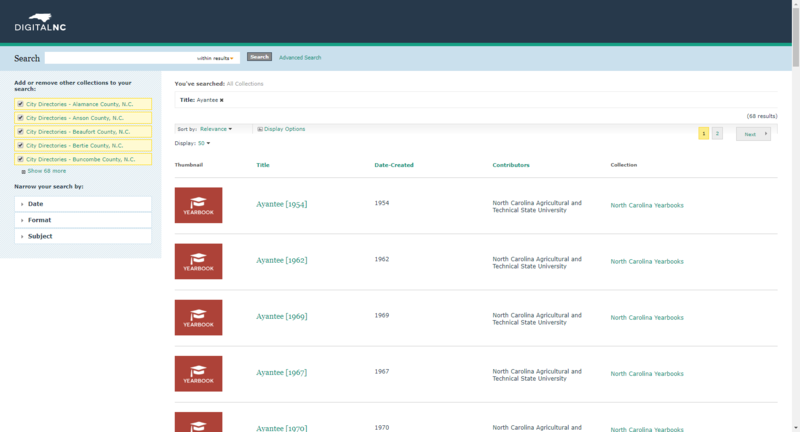 Oh, and one other important change – you will now be able to search across all of the yearbooks on DigitalNC.org! This was one of the most requested features for a new system, and we’re happy to deliver. Banners across our website will give you a heads up before we integrate the new system completely into DigitalNC.org, but you can try it out here. If you run into any challenges or have any positive feedback, please drop us a line at digitalnc@unc.edu. We’d love to hear your thoughts.